Social IT outbursts: How to find a white blackbird. Business luck, sales lead management and hard work? Success starts with vision. How to find a white blackbird. Business luck, sales lead management and hard work? Success starts with vision. 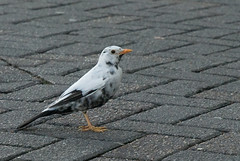 Have you ever seen a white blackbird? Of course not, you weren’t looking for one. It’s not going to fly in with a label like it flew out of the local natural history museum. So you gotta know what you are looking for first. Do you know what your ideal customer is for your business? If you don’t know, you won’t find them. And technology, marketing charts, business accounting, and 75 social networks won’t help. We attention deficit media overloaded people are waiting for the next best thing also called the bright shiny object (BSO). We should be asking ourselves if the bird that is in front of us is what we are really looking for without giving it our own label. But in order to do that we have to know what that one bird will look like before we see it. Are you willing to be lucky? Seth also finds a similar stream of thought in another post that propelled Thomas Alva Edison into success. The light bulb genius who said that genius is 99% perspiration (you know the rest) said “Opportunity is missed by most people because it is dressed in overalls and looks like work.” Seth rails against those people who are too lazy to make it happen for themselves by turning down opportunity in his post Different Kinds Of Work . I believe luck is about knowing your target and then moving towards it relentlessly. The person that spends their life researching that white blackbird and really knowing every last detail about them will have the greatest potential to find one. But they will never find one except on the web if they never leave their computer. That’s why it’s so important for entrepreneurs or marketing people to get up from their Aerons and go meet their customer. Bill Rice recently posted a follow-up blog to his Don’t Buy Lead Management Software post about why small organizations don't need to use sales lead management systems called Why Sales Organizations Rarely Grow. Bill sells lead management systems so I appreciate his honesty in letting us know that he knows who his customer really is and not convincing people who aren't his customer that they are. His customer is a company who has not self-limited themselves. A typical small company, he says, is not going to be his customer. The symptoms of a self-limiting sales group are lack of faith, a rigid process, lack of knowledge and fear of the new. It’s good to ask another why question at this point and see if you can dive deeper into the root causes of the symptoms of the self-limiting sales group. What allows those five problems to surface? For most of them, I think that’s it a lack of sales leadership. But you can still have a limited sales group if you don’t address the target market and put some elbow grease into it. The think-out-of-the-box type of brainstorming works to generate new ideas. They can address the rigid process and fear of the new. People can get trained. But without some success they will always distrust a new process. That’s one good reason why it’s so important to not do a full roll out before you’ve tested a little bit in a target market. But even with all that inspiration, it still takes Edison’s perspiration to make it work. And the work has to be directed to a goal that is dead on with the payload of the reason for doing it. The white blackbird is just a very small niche market that may look like another useless bird to many of the larger companies who will ignore it. But knowing that it’s the one thing that will make your fortune is the very first step to your success. First define your goal. Then, you work. The web makes for a great research tool but any successful entrepreneur will tell you that it’s the point at which you talk to your first venture capitalist or the understand the customer by asking them why you are important in their lives that will bring you closer to your mark. I was amazed that a small company like Argentine MaqTec with no customers but a solid vision of what was necessary to harvest olives did. They built a half-million dollar olive harvester in the middle of nowhere with no customers and persisted until they got customers. They sold one in Argentina and then three more in Australia and now have a great business. But imagine you are in the middle of nowhere, say a small farm community in north-east Iowa. What would you do if no one bought your product? It took leadership, a vision and hard work to get that company profitable. Picture your white blackbird. You might want to check in with people who have seem them before and make sure that’s what you want. Then get working and start planning your trip so you will get lucky. Great post. And thank you! Anytime I'm mentioned in the same breath with Seth Godin I'm staggeringly flattered. In this economy, I think we are all wise to search for and focus on our White Blackbirds. Thanks again for the thought and effort you put into this post. Inspiring.